August Laceless KAL – Clue 1 – Pictures! You are here: Home / August Laceless KAL – Clue 1 – Pictures! I figured it would be more fun for the veteran knitters if the Laceless clues were pictureless as well. But for those who are beginners, or would rather confirm their knitting with visuals, I’ll be sure to have pictures nearly every step of the way. First is Shawl Edging Row 1. 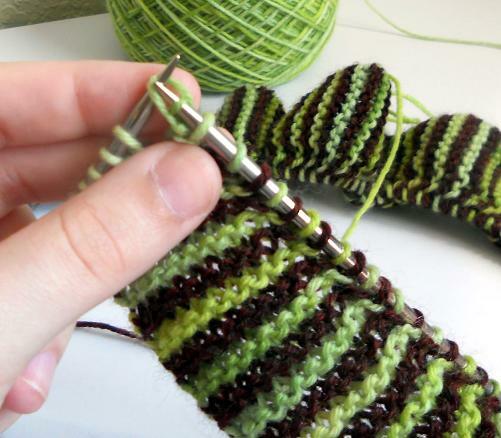 The cast on isn’t really vital to the finished product, so use whatever feels comfortable. 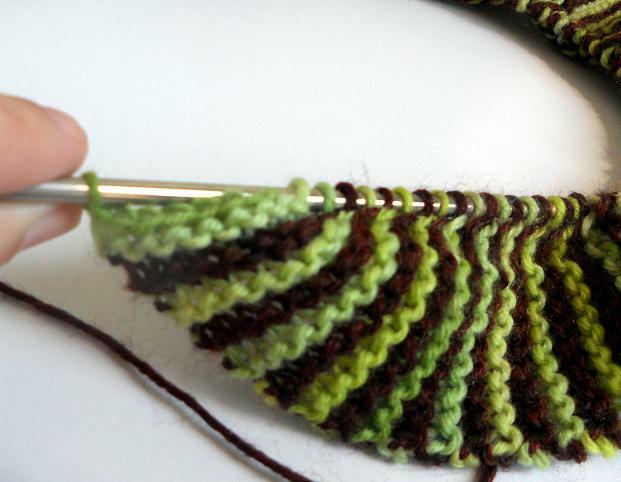 This is Shawl Edging Row 3. 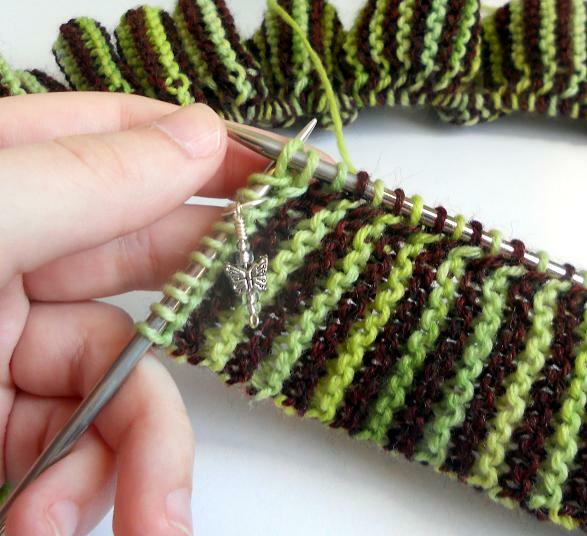 It makes more sense to show you the odd rows, because even rows end with stitches on both needles. 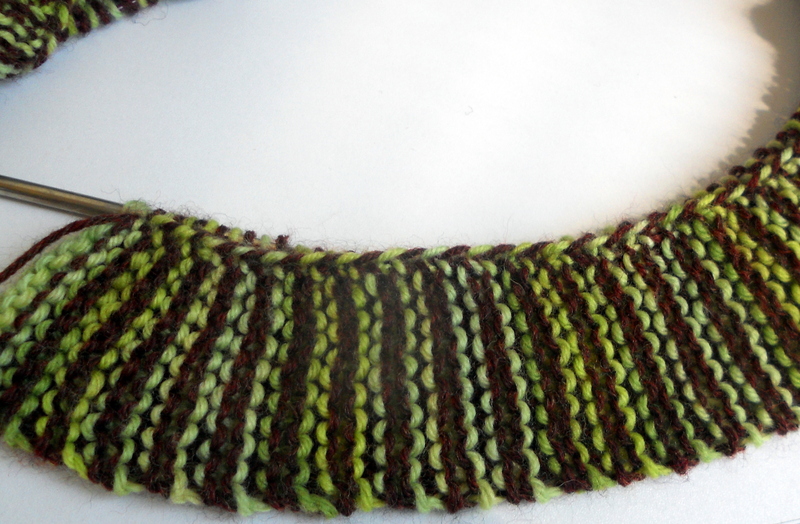 This is the first row worked in contrasting color. This is Shawl Edging Row 5. Same thing as Row 3, but in a different color. Now you get to repeat Rows 3-6 for quite a while. Notice how bunchy things start to look after the second repeat. 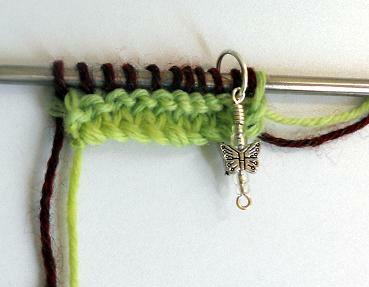 To get a more realistic view of your progress, slide the work down onto the cable as shown below. 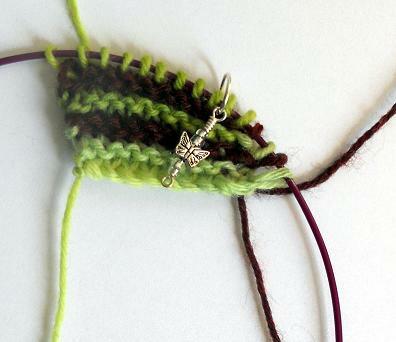 The extra stitches generated by kfb run along the side of the piece to be knit later. Nifty, right? It was all inspired by this post at leethal.net. 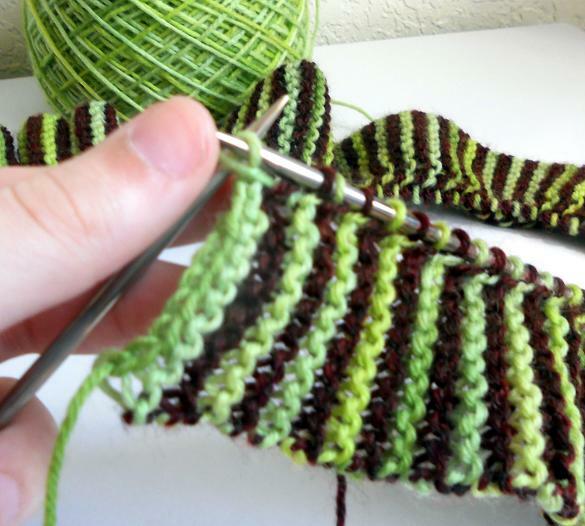 Lee’s sideways edge cast-on tutorial helped me decide that this was the perfect method to do a laceless edging without curling. Awesome! Thanks Lee! You’ll notice that it looks a lot better the farther you go. This is 24 1/2 of the required 333 stripes. And through the magic of the internet, we can skip ahead to the very last repeat of row 5. You’ll have something like this. It kind of reminds me of snake skin laying around after the snake has shed and moved on. Luckily, it won’t always look like this. And here’s a shot of the back. See how carrying the colors leaves an unobtrusive edge? 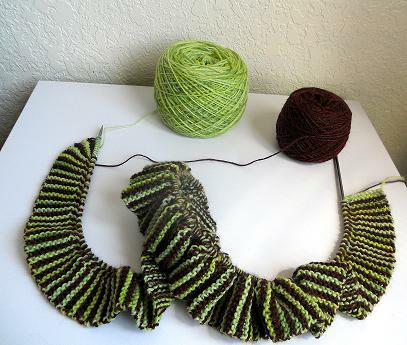 It’s even less noticeable on a finished shawl. 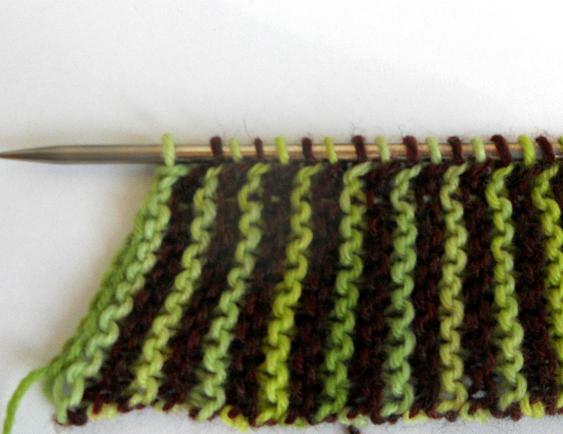 Now before I get carried away, we should probably go over the last row of the edging. We start with yet another KFB. Followed by a K1. Go ahead and remove your charming butterfly marker at this point. 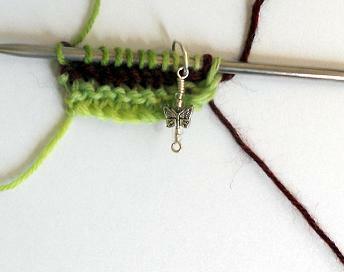 Now take the second stitch and pass it over the first to bind off. 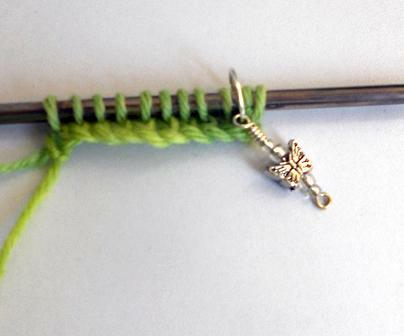 Continue knitting one, passing one over, until you get to this point. Good job! 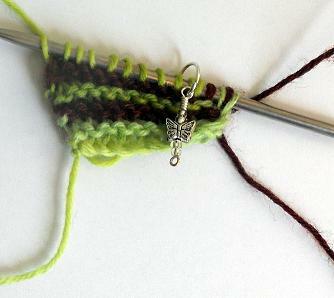 Cut the MC yarn, and pull it through that last loop. Cut the CC as well. 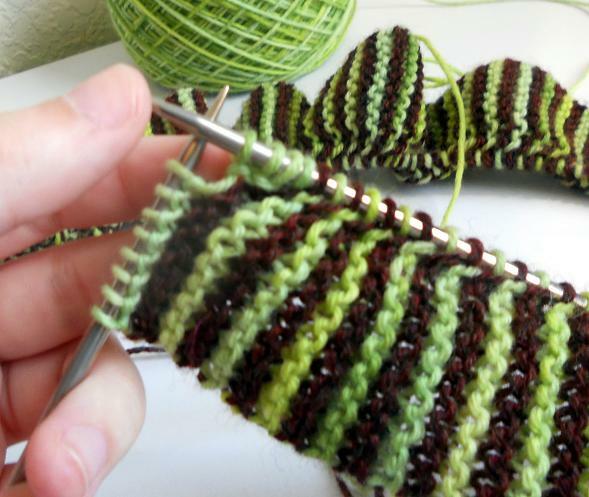 Having two green stitches next to each other kind of throws off our groove, wouldn’t you say? 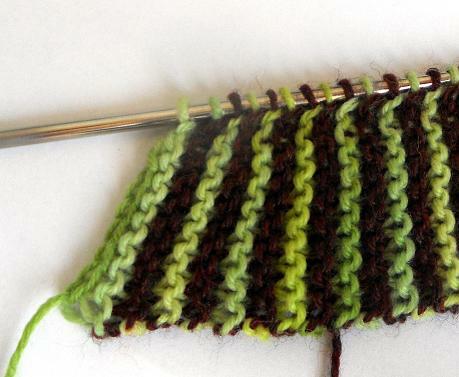 Let’s just pass the 2nd green stitch over the first. That looks much better, doesn’t it? We’re here! The end of Clue #1. 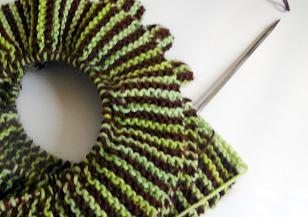 Curl up your nice finished edging and set it aside until next week. Thanks for the pics and detailed instructions, Manda! Very helpful and wow! It looks so awesome! Can’t wait to get started. My camera isn’t the best, but I’m trying to make it work!